Paris Was the Place, by Susan Conley, is a tightly woven narrative in disguise as a matryoshka gem; stories within stories, accounts built upon memories, foundations stabilized by uncertainty. It’s a story of regret, second chances, and blind faith. 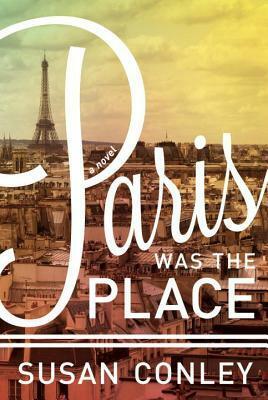 Don’t let the title of this book fool you: Paris accounts for only a third of the action recounted. From the Sonoran Desert of California, to the bustling energy of Rue de la Clef and the melancholy of Rue de Metz, to the humidity of a teahouse in Dharmsala, your imagination is taken on a journey through time and space. An astounding cornucopia of events are touched upon, ones you wouldn’t possibly believe could be woven satisfactorily together, and which seem to defy all logical separateness but which become cohesive: refugees seeking asylum, the manuscripts of a deceased Indian poetess, relationships made, broken, and tested, a decline through an HIV diagnosis, and the protagonist wading through her memories. Willow Pears, fondly known as Willie, takes on the responsibility of poetry teacher at a girl’s refugee center in Paris. Her job is to help teach them English and how to weave their own narratives coherently and colorfully in preparation for their court hearing, in an attempt to create enough sympathy from the judge so they could be granted asylum. “My plan, though uncooked, is to teach the girls poetry. I know this sounds a little ridiculous. We’re in a locked asylum center in the middle of Paris, and what the girls probably need most is a really good lawyer. But poetry is concise. It can hold enormous amounts of emotion… So they need poetry” (5). The girls have found their way to France a myriad of ways, but all seek the same goal: to find a safe harbor and to avoid having to go back to their home countries, which for some could mean a death sentence. While this could be considered the main vein of the novel, several other stories are happening in concert. Willie’s internal dialogue is riveting; her vivid memories unraveling her stability but also providing her a comfort that she frequently reaches back in time to grasp at. There’s a large preoccupation with direction throughout the novel; the construction of maps, old courses and new paths, and pedestrian travel which all point, like the tip of a compass needle, towards the larger scheme of navigation. These symbolic references sprinkled throughout, move Willie through time and space, forwards and backwards, like the ebb and flow of a steady ocean tide. As reader, we are also taken on this journey, as we feel the rise and fall of emotions and what exactly the future has the possibility of revealing. This is a book that slowly unfolds into several different characters’ lives, manifesting itself into a hybrid montage of incidences and experiences. While several stories seem to expand simultaneously, we’re also carried along the undercurrent of Willie’s memories, trying to swim through her conscious and subconscious concurrently. As we move through her daily motions, we’re confronted by a past, present, and future that she tries to reconcile—sometimes failing, but still moving through to understanding, and finally finding a place to rest her mind. As you discover the stories embedded in this book, you’ll also ascertain that they transcend Paris; that they truly transcend any single, one moment. And with a cast of characters so divine, you’ll wish you could invite them all for dinner, just so you can be a part of their memories for a little while longer.